This machine incorporates supercomputing and visualization technologies to simultaneously process 3D graphics, imaging, and video data in real time. This device implements ccNUMA architecture coupled with automatic scaling of system and graphics. 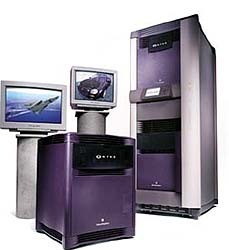 The system-based simulators deliver the lowest transport latency plus the unique ability to handle continuous, real-time fly-overs of arbitrarily large, geospecific terrain (up to and including the entire globe). The systems offers support preview at full film resolution. It support interactive, immersive visualization of unbounded volumes and full-product digital prototyping, allowing to engage several InfiniteReality subsystems simultaneously, and focusing power on solving a single visual problem. The heart of ccNUMA is the crossbar interconnect that moves data from CPUs and memory to every other part of the system: I/O, graphics, and other node boards. Each interconnect consists of eight bidirectional links. This means even the entry-level system handles 6.4GB per second of bandwidth. Each processor and every megabyte of memory are seamlessly interconnected to form a single machine image. Adding CPUs and memory increases the bandwidth of the entire system. Adding visualization subsystems increases the total host-to-graphics throughput. Silicon Graphics, Inc. (SGI), 11490 Westheimer Rd., Suite 100, Houston, TX 77077-6845. Tel: 281-293-9292; Fax: 281-293-0454.